Wells (/wɛlz/) is a cathedral city and civil parish in the Mendip district of Somerset, on the southern edge of the Mendip Hills. Although the population recorded in the 2011 census was only 10,536, and with a built-up area of just 3.245 square kilometres, Wells has had city status since medieval times, because of the presence of Wells Cathedral. Often described as England's smallest city, it is second only to the City of London in area and population, though not part of a larger urban agglomeration. Wells is named from three wells dedicated to Saint Andrew, one in the market place and two within the grounds of the Bishop's Palace and cathedral. A small Roman settlement surrounded them, which grew in importance and size under the Anglo-Saxons when King Ine of Wessex founded a minster church there in 704. The community became a trading centre based on cloth making and Wells is notable for its 17th century involvement in both the English Civil War and Monmouth Rebellion. In the 19th century, transport infrastructure improved with stations on three different railway lines. However, since 1964 the city has been without a railway link. The cathedral and the associated religious and medieval architectural history provide much of the employment. The city has a variety of sporting and cultural activities and houses several schools including The Blue School, a state coeducational comprehensive school that was founded in 1641, and the independent Wells Cathedral School, that was founded possibly as early as 909 and is one of the five established musical schools for school-age children in the United Kingdom. Wells' historic architecture has led to the city being used as a shooting location for numerous films and television programmes. ✪ Tour of Wells City on Market Day . . .
One of the three wells which give the city its name; two are located in the gardens of the Bishop's Palace (as shown) and one in the Market Place. The city was a Roman settlement that became an important centre under the Anglo-Saxons when King Ine of Wessex founded a minster church in 704. Two hundred years later, in 909, it became the seat of the newly formed bishopric of Wells; but in 1090, the bishop's seat was removed to Bath. The move caused severe arguments between the canons of Wells and the monks of Bath until 1245 when the bishopric was renamed the Diocese of Bath and Wells, to be elected by both religious houses. With the construction of the current cathedral and the bishop's palace in the first half of the 13th century, under the direction of Bishop Reginald and later Bishop Jocelin, a native of the city, Wells became the principal seat of the diocese. Wells was listed in the Domesday Book of 1086 as Welle, from the Old English wiells, not as a town but as four manors with a population of 132, which implies a population of 500–600. Earlier names for the settlement have been identified which include Fontanetum, in a charter of 725 granted by King Ina to Glastonbury and Fontanensis Ecclesia. Tidesput or Tithesput furlang relates to the area east of the bishops garden in 1245. Wells was part of, and gave its name to, the hundred of Wells Forum. Wells had been granted charters to hold markets by Bishop Robert (1136–66) and free burgage tenure was granted by Bishop Reginald (1174–1191). Wells was recognised as a free borough by a Royal charter of King John in 1201. The city remained under episcopal control until its charter of incorporation from Queen Elizabeth I in 1589. City status was most recently confirmed by Queen Elizabeth II by letters patent issued under the Great Seal dated 1 April 1974, which granted city status specifically to the civil parish; on that date major local government reorganisation came into effect, which involved the abolition of the municipal borough of Wells. During the English Civil War (1642–1651), at what became known as the "Siege of Wells", the city found itself surrounded by Parliamentarian guns on the Bristol, Glastonbury and Shepton Mallet sides. Col. William Strode had 2,000 men and 150 horse. The Royalists evacuated the city. Parliamentarian troops then used the cathedral to stable their horses and damaged much of the ornate sculpture by using it for firing practice. William Penn stayed in Wells shortly before leaving for America (1682), spending a night at The Crown Inn. Here he was briefly arrested for addressing a large crowd in the market place, but released on the intervention of the Bishop of Bath and Wells. During the Monmouth Rebellion (1685) the rebel army attacked the cathedral in an outburst against the established church and damaged the west front. Lead from the roof was used to make bullets, windows were broken, the organ smashed and horses stabled in the nave. Wells was the final location of the Bloody Assizes on 23 September 1685. In a makeshift court lasting only one day, over 500 men were tried and the majority sentenced to death. The 8th-century port at Bleadney on the River Axe enabled goods to be brought to within 3 miles (5 km) of Wells. In the Middle Ages overseas trade was carried out from the port of Rackley. In the 14th century a French ship sailed up the river and by 1388 Thomas Tanner from Wells used Rackley to export cloth and corn to Portugal, and received iron and salt in exchange. Wells had been a centre for cloth making, however in the 16th and 17th centuries this diminished, but the city retained its important market focus. Wells in the 19th century had the largest cheese market in the west of England. Wells first station, Priory Road, opened in 1859 on the Somerset Central Railway (later the Somerset and Dorset Joint Railway) as the terminus of a short branch from Glastonbury. A second railway, the East Somerset, opened a branch line from Witham in 1862 and built a station to the east of Priory Road. In 1870, the Cheddar Valley line branch of the Bristol and Exeter Railway from Yatton, reached Wells and built a third station at Tucker Street. Matters were simplified when the Great Western Railway acquired the Cheddar Valley and the East Somerset lines and built a link between them that ran through the S&DJR's Priory Road station. In 1878, when through trains began running between Yatton and Witham, the East Somerset station closed, but through trains did not stop at Priory Road until 1934. Priory Road closed to passenger traffic in 1951 when the S&DJR branch line from Glastonbury was shut, though it remained the city's main goods depot. Tucker Street closed in 1963 under the Beeching Axe, which closed the Yatton to Witham line to passengers. Goods traffic to Wells ceased in 1964. A Pacific SR West Country, West Country Class steam locomotive no 34092 built by the British Railways Board was named City of Wells following a ceremony in the city's Priory Road station in 1949. It was used to draw the Golden Arrow service between London and the Continent. It was withdrawn from service in 1964, and rescued from a scrapyard in 1971. It is now undergoing a complete restoration on the Keighley and Worth Valley Railway in Yorkshire. During World War II, Stoberry Park in Wells was the location of a prisoner-of-war camp, housing Italian prisoners from the Western Desert Campaign, and later German prisoners after the Battle of Normandy. Penleigh Camp on the Wookey Hole Road was a German working camp. The Market Place is the site of one of the city's ancient wells (note the water flowing in the gully, down High Street); the Bishop's Eye gatehouse (to the Bishop's Palace) is at the far end; two of Wells Cathedral's towers can be seen rising behind the buildings. Wells City Council is a parish council, with a membership of sixteen councillors, elected from three parish wards. They are (with the number of parish councillors each elects, in brackets): Central (four), St. Thomas' (six) and St. Cuthbert's (six). The civil parish of Wells was formed in 1933 upon the merger of Wells St Cuthbert In and Wells St Andrew (the latter being the historic liberty of the cathedral, the bishop's palace, etc., amounting to just 52 acres (21 ha)). Wells is the successor parish for Wells Municipal Borough, which existed from the creation of municipal boroughs in 1835 to their abolition in 1974. The parish has held the city status of Wells since 1 April 1974 (previously held by the municipal borough) and the member of the City Council who chairs the council holds the historic office of Mayor of Wells, typically for one year. The current mayor (for the 2018–19 municipal year) is Councillor Celia Wride, who is the 645th Mayor of Wells. She was elected to office on 18 May 2018. Another historic position is that of the Town Crier. The City Council has responsibility for local issues, including setting an annual precept (local rate) to cover the council's operating costs and producing annual accounts for public scrutiny. They also evaluate local planning applications and work with the local police, district council officers, and neighbourhood watch groups on matters of crime, security, and traffic. This includes city centre management including CCTV, an alcohol ban and regulating street trading permissions including the two funfairs held in the Market Place in May and November each year and the Wells In Bloom competition. The city council's role also includes initiating projects for the maintenance and repair of city facilities, as well as consulting with the district council on the maintenance, repair, and improvement of highways, drainage, footpaths, public transport, and street cleaning. They are involved in the management of the Community Sports Development Centre at the Blue School, the skateboard park and allotments in the grounds of the Bishop's Palace, Burcott Road and Barnes Close. Conservation matters (including trees and listed buildings) and environmental issues are also the responsibility of the council. The Town Hall was built in 1778, with the porch and arcade being added in 1861 and the balcony and round windows in 1932. It is a Grade II listed building. It replaced the former on the site of the Market and Assize Hall in the Market Place, and a Canonical House also known as 'The Exchequer', on the authority of an Act of Parliament dated 1779. The building also houses the magistrates courts and other offices. The Assize court last sat here in October 1970. Wells elects five councillors to Mendip District Council from the same three wards as are used for the City Council (two are returned from St Cuthbert's, two from St Thomas' and one from Central). The Mendip district was formed on 1 April 1974 under the Local Government Act 1972 and the district council is responsible for local planning and building control, local roads, council housing, environmental health, markets and fairs, refuse collection and recycling, cemeteries and crematoria, leisure services, parks, and tourism. Wells is an electoral division (with the same boundaries as the civil parish) of Somerset and returns one councillor to Somerset County Council, which is responsible for running the largest and most expensive local services such as education, social services, libraries, main roads, public transport, policing and fire services, trading standards, waste disposal and strategic planning. Wells is part of the UK Parliament constituency of Wells. Since 2015 the Member of Parliament for Wells is James Heappey of the Conservatives. Wells is within the South West England constituency of the European Parliament which elects six Members of the European Parliament using the d'Hondt method of party-list proportional representation. The Wells city arms show an ash tree surrounded by three water wells, crested with a gold mural crown, with the Latin motto Hoc fonte derivata copia (translated: "the fullness that springs from this well"). The council formalised twinning links with Paray-le-Monial, France, and Bad Dürkheim, Germany in 1979, then added Fontanellato, Italy in 1983; the Wells Twinning Association and the Mayor of Wells organise the twinning activities. HMS Somerset, Mary Bignal-Rand, Danny Nightingale, The Rifles and the late Harry Patch have the Freedom of the City. The Somerset Light Infantry received the freedom of the City of Wells following their return from Cyprus in 1956. Map of Wells showing city/parish border, and urban area. 4th smallest in the UK by population and urban area behind St Davids (1,841 residents, 0.23 sq mi), St Asaph (3,355, 0.50) and the City of London (8,072, 1.12). Wells lies at the foot of the southern escarpment of the Mendip Hills where they meet the Somerset Levels. The hills are largely made of carboniferous limestone, which is quarried at several nearby sites. In the 1960s, the tallest mast in the region, the Mendip UHF television transmitter, was installed on Pen Hill above Wells, approximately 2 miles (3.2 km) from the centre the city. Streams passing through caves on the Mendip Hills, including Thrupe Lane Swallet and Viaduct Sink (approximately 5 kilometres (3.1 mi) east of the city), emerge at Saint Andrew's Well in the garden of the Bishop's Palace, from where the water fills the moat around the Place and then flows into Keward Brook, which carries it for approximately a mile west to the point where the brook joins the River Sheppey in the village of Coxley. Along with the rest of South West England, the Mendip Hills have a temperate climate which is generally wetter and milder than the rest of England. The annual mean temperature is about 10 °C (50 °F) with seasonal and diurnal variations, but due to the modifying effect of the sea, the range is less than in most other parts of the United Kingdom. January is the coldest month with mean minimum temperatures between 1 °C (34 °F) and 2 °C (36 °F). July and August are the warmest months in the region with mean daily maxima around 21 °C (70 °F). In general, December is the dullest month and June the sunniest. The south west of England enjoys a favoured location, particularly in summer, when the Azores High extends its influence north-eastwards towards the UK. 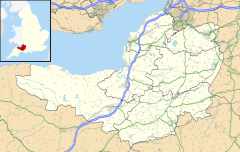 The civil parish of Wells is entirely surrounded by the parish of St Cuthbert Out. The population of the civil parish, recorded in the 2011 census, is 10,536. Of this number 97.5% are ethnically White (with the more specific White British category recorded at 93.5%) and 66.5% described themselves as Christian. The mean average age in 2011 was 41.9 years (the median age being 43). The population recorded for the Wells civil parish in the 2001 census was 10,406. Following construction of the A39/A371 bypass, the centre of the city has returned to being that of a quiet market town. It has all the modern conveniences plus shops, hotels and restaurants. Wells is a popular tourist destination, due to its historical sites, its proximity to Bath, Stonehenge and Glastonbury and its closeness to the Somerset coast. Also nearby are Wookey Hole Caves, the Mendip Hills and the Somerset Levels. Somerset cheese, including Cheddar, is made locally. Wells is part of the Wells & Shepton Mallet Travel to Work Area which also includes Glastonbury, Cheddar and surrounding areas. The historic part of the city is used for filming both documentaries and many period films and television series including some with very large productions. Recent examples (2014 to 2016) include filming for Series 2 of Poldark (2015 TV series), Dunkirk (2017 film), Another Mother's Son, Broadchurch, The Levelling, Mum's List and The White Princess (TV series) which will air in late 2017. In addition to Wells Cathedral, the Bishop's Palace, Wells is particularly popular among productions, with filming at the latter conducted (in 2015–2016) for The Huntsman: Winter's War, Galavant, Terry and Mason’s The Great British Food Trip, Escape to the Country and Holiday of My Lifetime, in addition to The White Princess (TV series). Wells is situated at the junction of three numbered routes. The A39 goes north-east to Bath and south-west to Glastonbury and Bridgwater. The A371 goes north-west to Cheddar and east to Shepton Mallet. The B3139 goes west to Highbridge and north-east to Radstock. Wells is served by First West of England bus services to Bristol, Bath, Frome, Shepton Mallet, Yeovil, Street, Bridgwater, Taunton, Burnham on Sea and Weston-super-Mare, as well as providing some local service. Some National Express coach services call at Wells. The bus station is in Princes Road. The Mendip Way and Monarch's Way long-distance footpaths pass through the city, as does National Cycle Route 3. Webberbus connects Wells to Weston-super-Mare, Highbridge and Bridgwater. Wells had two stations which were closed by the Beeching Axe in the 1960s such as Wells (Tucker Street) railway station and Wells (Priory Road) railway station. The nearest station now for the national rail network is Castle Cary. Wells stations on the Railway Clearing House map. The Blue School, founded in 1641, is a state coeducational comprehensive school and has been awarded Specialist science college status. It has 1,641 students aged 11–18 of both sexes and all ability levels. Wells Cathedral School, founded in 909, is an independent school that has a Christian emphasis and is one of the five established musical schools for school-age children in Britain. The school teaches over 700 pupils between the ages of 3 and 18. The school's boarding houses line the northern parts of the city and the music school retains close links with Wells Cathedral. The primary schools in Wells are Stoberry Park School, St Cuthbert's Church of England Infants School, St Cuthbert's Church of England Junior School and St Joseph and St Teresa Catholic Primary School. Wells and Mendip Museum includes many historical artefacts from the city and surrounding Mendip Hills. Wells is part of the West Country Carnival circuit. Wells Film Centre shows current releases and, in conjunction with the Wells Film Society shows less well known and historical films. The previous cinema, The Regal in Priory Road, closed in 1993 and is now Kudos Nightclub. It was built in 1935 by ES Roberts from Flemish bond brickwork with Art Deco features. It is a Grade II listed building, and was on the Buildings at Risk Register until its restoration which included the restoration and repair of the stained glass façade. Wells Little Theatre is operated by a voluntary society which started in 1902. In 1969 they took over the old boy's building of Wells Blue School, where they put on a variety of operatic and other productions. Milton Lodge is a house overlooking the city. It has a terraced garden, which was laid out in the early 20th century, is listed as Grade II on the Register of Historic Parks and Gardens of special historic interest in England. A walled precinct, the Liberty of St Andrew, encloses the twelfth century Cathedral, the Bishop's Palace, Vicar's Close and the residences of the clergy who serve the cathedral. Entrances include the Penniless Porch, The Bishop's Eye and Brown's Gatehouse which were all built around 1450. The Church of St Cuthbert (which tourists often mistake for the cathedral) has a fine Somerset stone tower and a superb carved roof. Originally an Early English building (13th century), it was much altered in the Perpendicular period (15th century). The nave's coloured ceiling was repainted in 1963 at the instigation of the then Vicar's wife, Mrs Barnett. Until 1561 the church had a central tower which either collapsed or was removed, and has been replaced with the current tower over the west door. Bells were cast for the tower by Roger Purdy. The polychromatic stone Church of St Thomas was built during 1856 and 1857 and extended by Samuel Sanders Teulon in 1864, commemorating the work of Richard Jenkyns the Dean of Wells who had cared for the poor in the east of the city. Wells Vineyard Church is an Evangelical Church formed in 2003. The cathedral is the seat of the Church of England Diocese of Bath and Wells. Wells has been an ecclesiastical city of importance since at least the early 8th century. Parts of the building date back to the tenth century, and it is a grade I listed building. It is known for its fine fan vaulted ceilings, Lady Chapel and windows, and the scissor arches which support the central tower. The west front is said to be the finest collection of statuary in Europe, retaining almost 300 of its original medieval statues, carved from the cathedral's warm, yellow Doulting stone. The Chapter House, at the top of a flight of stone stairs, leading out from the north transept is an octagonal building with a fan-vaulted ceiling. It is here that the business of running the cathedral is still conducted by the members of the Chapter, the cathedral's ruling body. Wells Cathedral clock is famous for its 24-hour astronomical dial and set of jousting knights that perform every quarter-hour. The cathedral has the heaviest ring of ten bells in the world. The tenor bell weighs just over 56 CWT (6,272 lb, 2,844 kg). The Vicars' Close is the oldest residential street in Europe. The Close is tapered by 10 feet (3.0 m) to make it look longer when viewed from the bottom. When viewed from the top, however, it looks shorter. The Old Deanery dates from the 12th century, and St John's Priory from the 14th. The street is owned by Wells Cathedral. The Bishop's Palace has been the home of the bishops of the Diocese of Bath and Wells for 800 years. The hall and chapel date from the 14th century. There are 14 acres (5.7 ha) of gardens including the springs from which the city takes its name. Visitors can also see the Bishop's private chapel, ruined great hall and the gatehouse with portcullis and drawbridge beside which mute swans ring a bell for food. The Bishop's Barn was built in the 15th century. The city has two football clubs, one being Wells City F.C., past winners of the Western League. Belrose FC play their football in the Mid-Somerset Football League at Haybridge Park. Wells Cricket Club runs eight sides across senior, junior and women's cricket; they are based at South Horrington. Wells Wanderers Cricket Club are based in Meare. Rowdens Road Cricket Ground was a first-class venue, no longer a cricket ground, now occupied in part by Wells FC. Mid Somerset Hockey Club and Wells City Acorns Hockey Club both play on the Astroturf pitches at the Blue School, where several other sports clubs are based. Wells Leisure Centre has a 25 metres (82 ft) swimming pool, gymnasium, sports hall, sauna, steam room, relaxation area and solarium. The 18 hole Wells Golf Club is on the outskirts of the city and also has a 24 bay driving range with optional grass tees. Elizabeth Goudge used Wells as a basis for the fictional cathedral city of Torminster, in her book A City of Bells. Wells has been used as the setting for several films including: The Canterbury Tales (1973), A Fistful of Fingers (1994), The Gathering (2003), The Libertine (2004), The Golden Age (2007), and Hot Fuzz (2007, as Sandford). The cathedral interior stood in for Southwark Cathedral during filming for the Doctor Who episode The Lazarus Experiment, and was also used as an interior location in the film Jack the Giant Slayer (2013), and in 2017 for the film Hellboy. In 2017 the market square and town hall was used for production of the BBC series Poldark. Hugh of Wells – native of Wells, Bishop, elder brother of Jocelin of Wells. Jocelin of Wells – native of Wells, Bishop, aided in creation of Magna Carta and largely responsible for the construction of the cathedral. Herbert E. Balch – cave explorer and founder of Wells Museum. His name was given to Balch Road, a council estate that was built in the 1950s. Mary Bignall-Rand – Gold medalist and world record breaker in the long jump at the 1964 Summer Olympics. Harry George Crandon – awarded the Victoria Cross during the Boer War. Sir Chris Clarke – county councillor for Wells from 1985 to 2005. Alexander Davie – born in Wells 1847, became 7th Premier of British Columbia. Elizabeth Goudge – author of novels, short stories and children's books, was born in Wells in 1900. Roger Hollis – Director General of MI5. John Holloway – Governor of Newfoundland (1807–1809) and Admiral of the Blue. John Keate – born in Wells 1773, went on to become headmaster at Eton where he restored discipline with the birch, and once flogged 80 boys in one day. James Keene – professional footballer formerly of Portsmouth F.C., playing for IF Elfsborg in Sweden. Harry Patch – last trench veteran of World War I, and at 111, briefly the oldest man in Europe and 3rd oldest man in the world. He was born in the nearby village of Combe Down and at the time of his death in July 2009 he was living in local care home Fletcher House. Kris Marshall – actor, raised in the city and currently lives nearby. Edgar Wright – film and television director. Directed Hot Fuzz, which was filmed in the city. ^ a b c "Wells CP – Usual Resident Population, 2011". Neighbourhood Statistics. Office for National Statistics. Retrieved 24 December 2014. ^ "Wells". Collins Dictionary. n.d. Retrieved 24 September 2014. ^ "Wells, Somerset, Built-up Area". City Population. City Population. 2016. Retrieved 4 January 2017. ^ Else, David (2009). "Great Britain (Lonely Planet Country Guides)". amazon.co.uk. p. 339. ISBN 978-1-74104-491-1. Retrieved 14 October 2011. ^ Historic England. "The Well House (483263)". Images of England. Retrieved 24 August 2006. ^ Black Dog of Wells (2016). "Film and Television in Wells". The Crown at Wells, C1450. The Crown at Wells and Anton's Bistrot. Retrieved 4 January 2017. ^ "Wells Cathedral". Britania.com. Retrieved 23 January 2010. ^ Robinson, Stephen (1992). Somerset Place Names. Wimbourne: The Dovecote Press Ltd. ISBN 978-1-874336-03-7. ^ Havinden, Michael (1982). The Somerset Landscape. The making of the English landscape. London: Hodder and Stoughton. p. 210. ISBN 0-340-20116-9. ^ a b "A List of the Latin Names of Places in Great Britain and Ireland". White Trash Scriptorium. Retrieved 4 February 2010. ^ Reid, R.D. (1963). Wells Cathedral. Friends of Wells Cathedral. p. 10. ISBN 0-902321-11-0. ^ a b Gathercole, Clare. "An archaeological assessment of Wells" (PDF). English Heritage Extensive Urban Survey. Somerset County Council. Archived from the original (PDF) on 29 April 2014. Retrieved 4 February 2010. ^ Havinden, Michael (1981). The Somerset Landscape. The making of the English landscape. London: Hodder and Stoughton. p. 114. ISBN 0-340-20116-9. ^ a b c Leete-Hodge, Lornie (1985). Curiosities of Somerset. Bodmin: Bossiney Books. p. 29. ISBN 0-906456-98-3. ^ "Changes of Monarch". History. Wells Cathedral. Archived from the original on 11 March 2009. Retrieved 15 March 2009. ^ Clarkson, Thomas (1827). Memoirs of the Private and Public Life of William Penn. S.C. Stevens. p. 57. Retrieved 28 November 2009. ^ "The Monmouth Rebellion and the Bloody Assize". Aspects of Somerset History. Somerset Archive & Record Service. Retrieved 1 March 2009. ^ "The Bloody Assize". Somerset Archive & Record Service. Retrieved 9 October 2007. ^ "Medieval town, Wells". Somerset Historic Environment Record. Somerset County Council. Retrieved 4 February 2010. ^ a b "Wells". Somerset & Dorset Joint Railway. Retrieved 4 February 2010. ^ Oakley, Mike (2002). Somerset Railway Stations. Wimborne: Dovecote Press. p. 126. ^ "City of Wells 34092 NEWS". Railwells. Retrieved 7 October 2012. ^ Thomas, Roger JC. "Prisoner of War Camps(1939–1948)" (PDF). English Heritage. Retrieved 4 February 2010. ^ a b c "City of Wells". Wells City Council. Retrieved 21 September 2007. ^ "Wells RD". A vision of Britain Through Time. University of Portsmouth. Retrieved 4 January 2014. ^ a b Historic England. "Town Hall (83446)". Images of England. Retrieved 2 March 2009. ^ "The Town Hall". Wells City Council. Archived from the original on 13 July 2009. Retrieved 2 March 2009. ^ "Cornwall and Wessex Area". Civic Heraldry of England and Wales. Retrieved 20 December 2014. ^ "Wells Twinning Association". www.facebook.com. Retrieved 2019-03-20. ^ "Wells Twinning Association – Wells City Council serving Englands smallest Cathedral City". ^ "City of Wells". Royal Navy (crown Copyright). Retrieved 28 November 2009. ^ "Minutes of the City Council" (PDF). Wells City Council. 14 February 2007. Archived from the original (PDF) on 20 March 2009. Retrieved 3 March 2009. ^ "Freedom of Wells for Britain's oldest soldier". Defence News. Ministry of Defence. 11 July 2008. Archived from the original on 7 August 2009. Retrieved 3 March 2009. ^ "The Somerset & Cornwall Light Infantry". British Light Infantry Regiments. Retrieved 1 February 2016. ^ "Charter of Incorporation" (PDF). ^ "DIAMOND JUBILEE CIVIC HONOURS COMPETITIONS - ENTRY GUIDELINES" (PDF). Her Majesty The Queen has agreed that competitions may be held for a grant of city status and a grant of Lord Mayoralty (called a Lord Provostship in Scotland) to mark Her Diamond Jubilee in 2012. 3. Applications may only be made by an elected local authority – normally, in respect of the entire local authority area. ^ "ONS Geography Linked Data - Browse Data". statistics.data.gov.uk. ^ "Mendip Transmitter". A.T.V. (Aerials and Television). Retrieved 14 March 2010. ^ Gray, Alan; Taviner, Rob; Witcombe, Richard (2013). Mendip Underground: A Caver's Guide (5th ed.). Wells: Mendip Cave Registry and Archive. pp. 397, 434. ISBN 9780953131051. ^ "Thrupe Lane Swallet". Mendip Cave Registry & Archive. 2009. Retrieved 8 December 2013. ^ "Viaduct Sink". Mendip Cave Registry & Archive. Retrieved 14 January 2014. ^ "Keward Brook". Somerset Rivers. Retrieved 16 December 2017. ^ a b "South West England: climate". Met Office. Archived from the original on 5 June 2011. Retrieved 14 March 2010. ^ "Ethnic Group, Wells Parish". Office for National Statistics. Retrieved 16 February 2016. ^ "Religion, Wells Parish". Office for National Statistics. Retrieved 16 February 2016. ^ "Age Structure, Wells Parish". Office for National Statistics. Retrieved 16 February 2016. ^ "Businesses & Shops in Wells". Wells Tourism Web Site. Mendip District Council. Archived from the original on 25 March 2010. Retrieved 24 April 2010. ^ "Wells". Tour UK. Retrieved 7 October 2012. ^ "Travel to Work Areas, 2001" (PDF). National Statistics. Archived from the original (PDF) on 5 March 2009. Retrieved 5 March 2009. ^ Magistrates Reporter (25 December 2016). "Dunkirk, The White Princess, Broadchurch, Poldark: when will scenes shot in Somerset be on screen?". Somerset Live. Local World. Retrieved 4 January 2017. See the video in our story here for a glimpse of the actors filming the highly anticipated drama. ^ "Ordnance Survey Get-a-map". pp. ST 548 455. Retrieved 1 March 2009. ^ "Wells Blue Schoo Historyl". Wells Blue School Website. Retrieved 19 March 2010. ^ "Blue School, Wells" (PDF). Ofsted. Retrieved 27 February 2018. ^ "Wells Cathedral School". Wells Cathedral School. Retrieved 2 March 2009. ^ "Collections". Wells and Mendip Museum. Archived from the original on 29 August 2009. Retrieved 4 February 2010. ^ "The Wells Film Society". The Wells Film Society. Archived from the original on 19 March 2011. Retrieved 20 March 2010. ^ Historic England. "Regal Cinema (483491)". Images of England. Retrieved 20 March 2010. ^ "Historic Buildings at Risk Register Success Stories" (PDF). Mendip District Council. p. 33. Archived from the original (PDF) on 11 June 2011. Retrieved 20 March 2010. ^ "The Society". Little Theatre Wells. Retrieved 20 March 2010. ^ Historic England. "Milton Lodge and The Combe (1001277)". National Heritage List for England. Retrieved 8 November 2013. ^ Historic England. "Penniless Porch Gateway to Cathedral Green, Wells (483442)". Images of England. Retrieved 13 January 2009. ^ Historic England. "The Bishop's Eye, Wells (483444)". Images of England. Retrieved 13 January 2009. ^ Historic England. "Brown's Gatehouse, Wells (483519)". Images of England. Retrieved 13 January 2009. ^ Historic England. "Church of St Cuthbert (483529)". Images of England. Retrieved 24 August 2006. ^ Historic England. "Nos.14–27 Vicars Close (483617)". Images of England. Retrieved 24 August 2006. ^ "Our Church". St Cuthbert, Wells. Retrieved 5 March 2008. ^ "Bells in St Cuthberts Tower, Wells, Somerset". Notes & Queries. s2-IV(93): 284–285. 1857. doi:10.1093/nq/s2-IV.93.284-b. ^ "History of St Thomas Church". St Thomas, Wells. Retrieved 29 December 2017. ^ Historic England. "Church of St Thomas (1383153)". National Heritage List for England. Retrieved 29 December 2017. ^ "Home". www.wellsvineyard.com. Retrieved 2018-09-28. ^ Historic England. "Cathedral Church of St Andrew, Chapter House and Cloisters (483287)". Images of England. Retrieved 24 August 2006. ^ "Stop 5: Wells, Somerset". Britannia's Magical History Tour. Britania Travels. Retrieved 4 February 2010. ^ "The West Front". Wells Cathedral. Archived from the original on 20 January 2010. Retrieved 4 February 2010. ^ Ashurst, John; Dimes, Francis G. (1998). Conservation of building and decorative stone (2 ed.). Butterworth-Heinemann. p. 102. ISBN 978-0-7506-3898-2. ^ Historic England. "Chapter House to Cathedral Church of St Andrew (483286)". Images of England. Retrieved 24 August 2006. ^ "Bells". Wells Cathedral. Archived from the original on 29 July 2008. Retrieved 4 August 2008. ^ Historic England. "Nos.1–13 Vicars Close, Wells (483615)". Images of England. Retrieved 13 January 2009. ^ Historic England. "Nos.14–27 Vicars Close, Wells (483617)". Images of England. Retrieved 13 January 2009. ^ Historic England. "Boundary walls to Nos.1–13 Vicars Close, Wells (483616)". Images of England. Retrieved 13 January 2009. ^ Historic England. "Boundary walls to Nos.14–27 Vicars Close, Wells (483618)". Images of England. Retrieved 13 January 2009. ^ Historic England. "The Vicars' Chapel Vicars Close, Wells (483619)". Images of England. Retrieved 13 January 2009. ^ Historic England. "The Vicars' Hall Vicars Close, Wells (483620)". Images of England. Retrieved 13 January 2009. ^ Historic England. "Gatehouse and south boundary wall to the Old Deanery, Wells (483311)". Images of England. Retrieved 13 January 2009. ^ Historic England. "Old Deanery Court, with link wall along east side The Old Deanery, Wells (483310)". Images of England. Retrieved 13 January 2009. ^ Historic England. "The Old Deanery, Wells (483309)". Images of England. Retrieved 13 January 2009. ^ Historic England. "No.2 St John's Priory, with front boundary wall and railings, Wells (483533)". Images of England. Retrieved 13 January 2009. ^ Historic England. "The Bishop's Palace and Bishop's House (483259)". Images of England. Retrieved 24 August 2006. ^ "Bishop receives Royal swan gift". BBC News. 19 September 2006. Retrieved 10 November 2007. ^ Historic England. "The Bishop's Barn, Wells (483576)". Images of England. Retrieved 13 January 2009. ^ "Wells City". Football Club History Database. Retrieved 4 February 2010. ^ "Wells Cricket Club". Wells Cricket Club. Archived from the original on 19 January 2015. Retrieved 18 January 2015. ^ "Wells Wanderers CC". Wells Wanderers CC. Archived from the original on 3 March 2010. Retrieved 4 February 2010. ^ "Mid Somerset Hockey Club". Mid Somerset Hockey Club. Archived from the original on 17 December 2009. Retrieved 4 February 2010. ^ "Wells Blue Sports Centre". The Blue School. Retrieved 7 June 2012. ^ "Wells Leisure Centre". Avalon leisure. Archived from the original on 24 January 2010. Retrieved 4 February 2010. ^ "The Course". Wells Golf Club. Retrieved 4 February 2010. ^ Gaudin, Deborah. "A Short Biography of Elizabeth Goudge". Elizabeth Goudge Society. Archived from the original on 28 July 2009. Retrieved 4 February 2010. ^ "Wells Tourist Information". iknow Somerset. Retrieved 16 March 2010. ^ "A Fistful of Fingers". IMDB. Retrieved 4 February 2010. ^ "Filming locations for The Gathering". IMDB. Retrieved 4 February 2010. ^ a b c "Showbiz Somerset". Art, films and television. BBC. Retrieved 4 February 2010. ^ "Hot Fuzz-Production Notes p.2". CinemaReview. Retrieved 23 March 2009. ^ Hooper, James (7 June 1994). "To he who lit the Stygian caves". Depth through thought -OUCC News. Oxford University Cave Club. Retrieved 2 May 2008. ^ "Wells Natural History and Archaeological Society". Wells Museum website. Archived from the original on 29 August 2009. Retrieved 4 February 2010. ^ "Wells Market Place". City of Wells. Archived from the original on 23 September 2009. Retrieved 4 February 2010. ^ "Grave Location for Holders of the Victoria Cross In the City of Manchester". The Victoria Cross Website. Archived from the original on 29 September 2007. Retrieved 25 September 2007. ^ Lewis, Zane H. (1982). "Davie, Alexander Edmund Batson". In Halpenny, Francess G. Dictionary of Canadian Biography. XI (1881–1890) (online ed.). University of Toronto Press. ^ Ovens, Ruth (June 13, 2016). "A sneak peek inside The Rib in Wells, 'The house with a cathedral in its garden' bought for £2m". Somerset Live. Local World. Retrieved 14 June 2016. ^ Trahair, R.C.S (2004). Encyclopedia of Cold War espionage, spies, and secret operations. Greenwood Press. p. 122. ISBN 978-0-313-31955-6. ^ Thompson, Frederic F. (1987). "Holloway, John". In Halpenny, Francess G. Dictionary of Canadian Biography. VI (1821–1835) (online ed.). University of Toronto Press. ^ "Keate, John (KT792J)". A Cambridge Alumni Database. University of Cambridge. ^ "James Keene". Goalserve. Retrieved 20 March 2010. ^ "WWI veteran Patch dies aged 111". BBC News. 25 July 2009. Retrieved 5 January 2010. ^ Bull, Sarah (8 February 2012). "Actor Kris Marshall marries in his hometown". Daily Mail. London. ^ Davidson, Max (2 August 2008). "Town vs gown: Wells, Somerset". London: Telegraph. Retrieved 4 February 2010. Wikimedia Commons has media related to Wells, England.